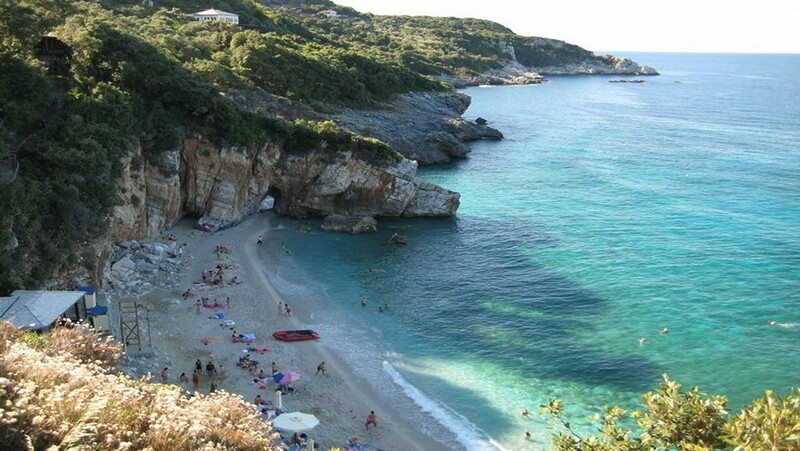 Agios Ioannis is the central village of the area with a beautifull clean and sandy beach with small pebbles. There is a lifeguard station and personel that take care for the safety of the bathers. Only 1 km away from Apartments – Studios – Rooms Felitsia the traveller can enjoy fresh fish and traditional greek and pelion food at the taverns, at the oyzeri and walk along the coast of Agios Ioannis where all the village is alongside built, enjoy the music, shop and enjoy the night life. There are a lot of Cafe-bars, Mini-markets, Taverns, Ouzeri, the church of Agios Ioannis and a small and traditional fishing port. Your stay at our accommodation will relax you and keep you away from disturbing noise of the traffic during summertime. Towards the side of the Aegean Sea, 48 km. away from Volos there is this village. Great view to the sea, plenty footpaths and cobbled roads for walking to the village or the forest. The churches of Saint George, Saint Dimitrios, Saint Jon the Baptist, Metamorphosis of Jesus and the church of Virgin Mary all have wall paintings and freecut wooden temples. Very interesting is the spring of Xinovrisi. On the 8th of May there is a local fair of Saint John the Baptist.At the end of June towards start of September many cultural events take place. Enjoy the magnificent beach of Agios Ioannis ! Village on the mountain, 45 km. from Volos, on the curved roads of the side of the mountain towards Makriraxi. Here you can visit the churches of Virgin Mary, Saint George and Saint Athanasios, admirable for their architecture since the end of 18 th Century. Extremely beautifull beaches of Banikas and Plaka. 32 km. away from Volos and it is one of the most beautifull villages of Pelion not only because of its natural beauty but also because of historical interest. Numerous old mansions, graphical footpaths – cobbled road and traditional towers all exist since prosperous economical times of the area, give this village a uniqueness. Here there is the monastery of Saint John the Baptist, the church of Life Giving spring – 1725 as well as Mousga sample of covered spring – 1888. 3 festivals take place named Agioi Anargyroi – 1st of July, Saint John on the 29th of August, and one of the Virgin Mary on the 15th of August. 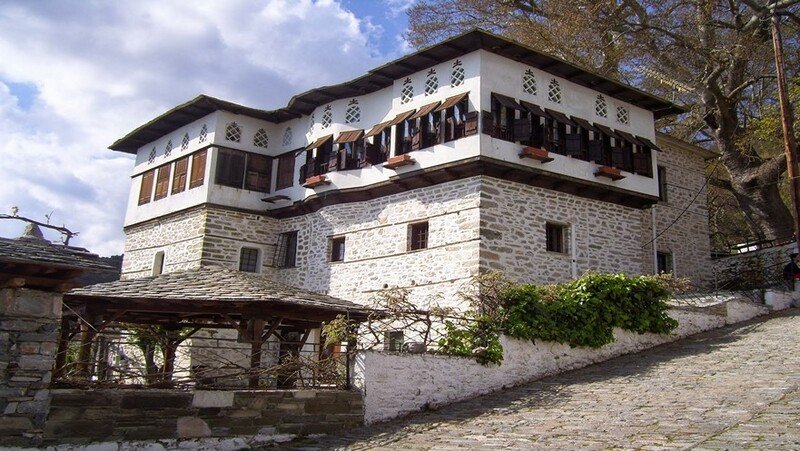 Inside forests and hillsof Pelion, Vizitsa, with its great mansions, has won the Golden Apple as one of the best kept in time traditional village. Very important is the architecture of the houses and the beautifull flora. At the entrance of the village predominates the monastery of Saint John the Baptist -1771. In the area exists folklore collection with old farmer tools, pottery used in houses and guns. It is the biggest main village of the area of Pelion, and the distance from Volos is about 45 km. It consists of four settlements – Agia Paraskevi or Perachora, Agia Kyriaki, Agios Georgios and Sotira. The village was built on a green downhill with many running waters, and has been built with center the Monastery of Metamorphosis – Transformation of Sotira that has been found around 1160. Unfortunately it was destroyed on 1887 due to fire. The village has remained almost untouched from the Turkish invasion and reached its flourish around 17th and 18th century. Men of great intelligence have been born here like Patriarch Kallinikos the III, the historian Ioannis Kordatos and the national benefactors, Al.Pantos and Dimitris Polymeris. 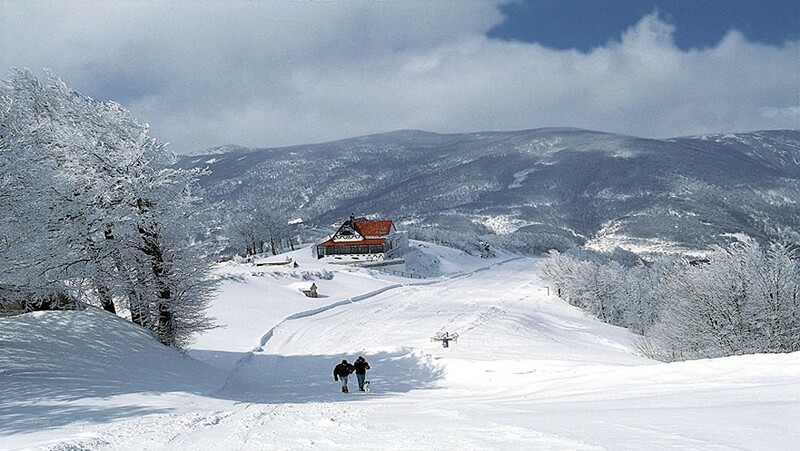 Zagora in Pelion Greece has been a very important educational center of Pelion. At is historic school with 18.000 books great men have studied amongst them Rigas Feraios. There are extraordinary mansions, like Kassavetis mansion, Priggos mansion and that of the poet Petros Magnis. There is a very important Byzantine basilica church of Agios Georgios consisting of 3 parts and was built on 1765. The fair of Agios Triantaffylos from Pelion takes place on 8 August. Τhis beautiful village of Pelion in Greece is 48 km away from Volos. At the scenery you will find dominant trees such as beeches, chestnuts and ivies. It has been one of the most important great villages of Pelion. Since 1753 there was also a school that Rigas Feraios has taught at. 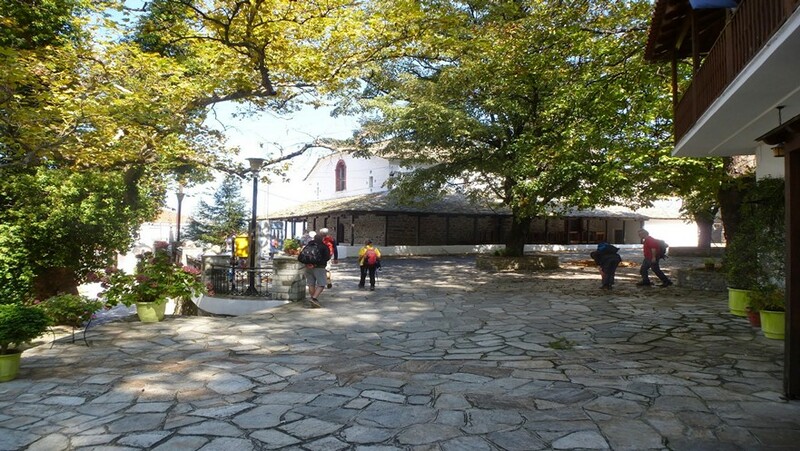 At the patio plaza one may find the Church of Agia Marina and that is the most known church of the whole mountain of Pelion. The wooden-carved temple took about 60 years of work and is embellished from marvelous hagiographies of Giannis Pagonis. The Byzantine ecclesiastical drawings of the temple is a gift of the monks of Agio Oros. You will also find Ecclesiastical Museum as well as Ecclesiastical gallery. Close by this village you may find the beaches of Papa Nero and Agios Ioannis as well as Plaka beach. Built on a steep hill, with intense traditional colors, Makrinitsa in Pelion Greece has been commented by many as the balcony of Pelion. You may admire mansions with roofed verandas and colorful windows. 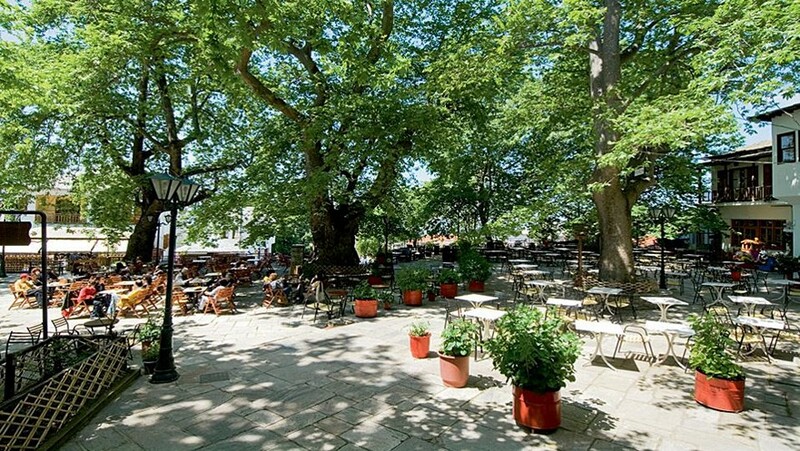 Under age-long trees, at the central square of the village, the view towards Volos is extraordinary. You may begin your touring from the folklore museum. In Topalis mansion you may find the folklore museum, under the central square and includes local costumes, lots of needlework etc. You may visit also the church of Virgin Mary of Makrinitsa built around 1767, in Agia Triada, the church of Agios Ioannis the Precursor (Prodrome) built around 1806. At the highest point of the village there is the historical monastery of Virgin Mary of Sourvia, where one of the most important battles took place in 1876 against the Turks. Until one point you may drive with your own car and beyond a point walking for about one hour. 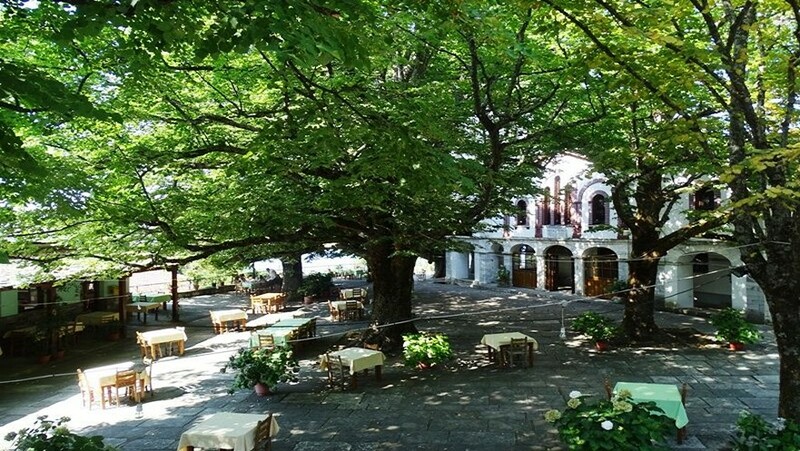 On 15th of August in Makrinitsa in Pelion Greece a fair takes place and every year the known custom of May (a series of ceremonial shows that has its roots in the ancient Dionysian ceremonies. Milies possess significant importance in modern Greek history. Homeland of Anthimos Gazis and of other teachers of the Greek genre. The great library of the village is well known for the collection of rare books, manuscripts, physics and chemistry instruments, which have been used for 5 years before the revolution at the famous School of Milies in Pelion Greece. One may find the articles of association according to which Anthimos Gazis, Grigorios Konstandas and Daniil Filippidis have offered each 500 gold coins for the building of this school. At the local museum you will find θα δείτε needlework, textiles, holly stations and objects of types of jobs that have perished and long forgotten together with their respective pictures. The area of the old station is extraordinary, with the steel σιδερένια curvy bridge, masterpiece of the engineer Evaristo De Chirico, the father of the great Giorgio de Kiriko who has designed the whole installation. 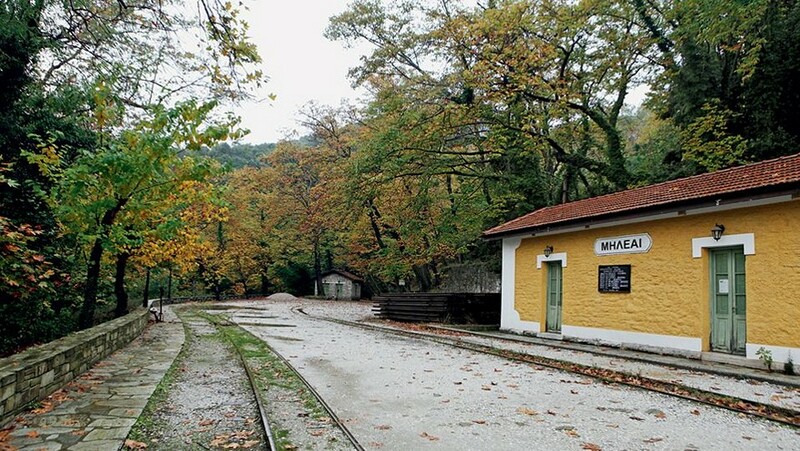 The traditional old train that reaches Milies in Pelion Greece starts from the village Kato Lechonia which is 11 km away from Volos. 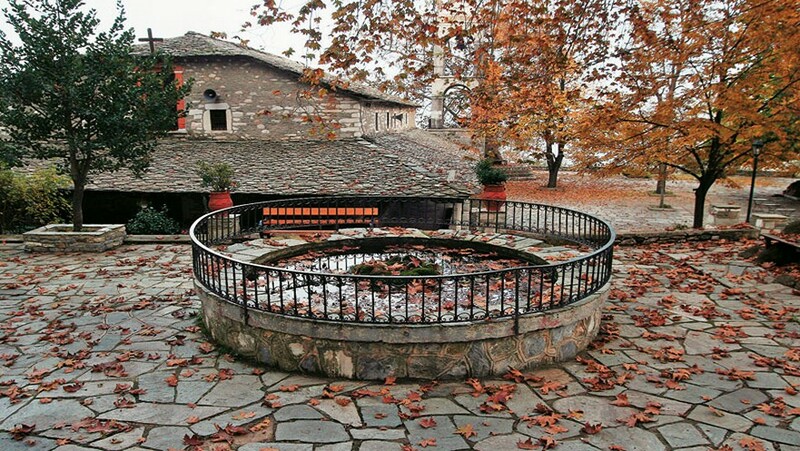 At the central square of the village one may find magnificent marble fount of 18th century and the historical church of Greatest Archangels, with many element of the local traditional architecture. The great flag of our nation has risen and is being kept in the library of the village. As you start leaving from Milies in Pelion Greece do not forget to try cheese-bread olive-bread, galopita (a type of pie made out of milk, eggs, corn flower and sugar), local sweets of apple and almond. Local traditional food specialties amongst many: frumenty, meat (eksohiko), kokoretsi, fried eggplant and pies. 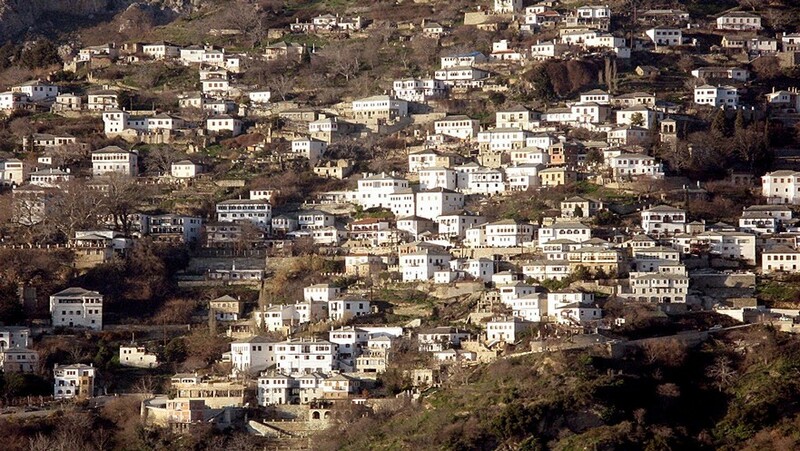 This is a graphical village of Pelion in Greece, 52 km from Volos town. During the Turkish invasion it is one of the most important monastery property of the area. It is worth while visiting the churches of Agia Paraskevi, Agios Fanourios και of the Assumption. Fairs: Agia Triada, and Agios Fanourios on 27th of August and of the holy cross on the 14th of September. 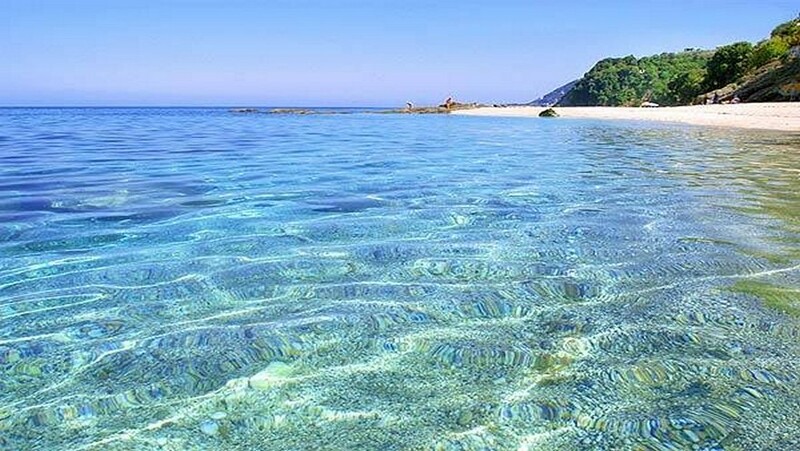 At the settlement of Damouhari, that is the only physical port of Eastern Pelion there are very beautiful beaches with wild and imposing landscape. 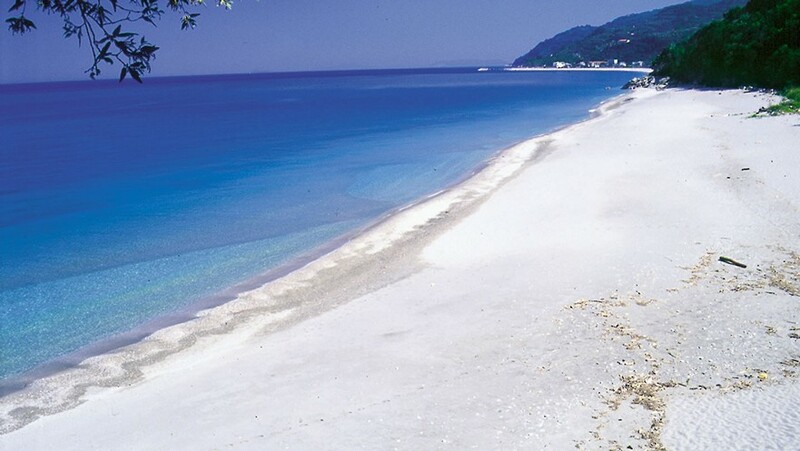 The most graphical beach of Pelion with the sand and the crystal clear waters. You can park your car on top of the beach at a parking lot. From here a cement staircase will lead you to the beach. 100 meters further away, there is a rock with a huge hole that splits the beach in two parts while it is a physical door to the second wider beach. You may admire a unique view. South of Milopotamos in Pelion Greece, Lambinou village is built on top of the seaside in a much more quite landscape than that of Tsagarada. Here you can visit the Monastery of Shining Virgin Mary (Labidona). 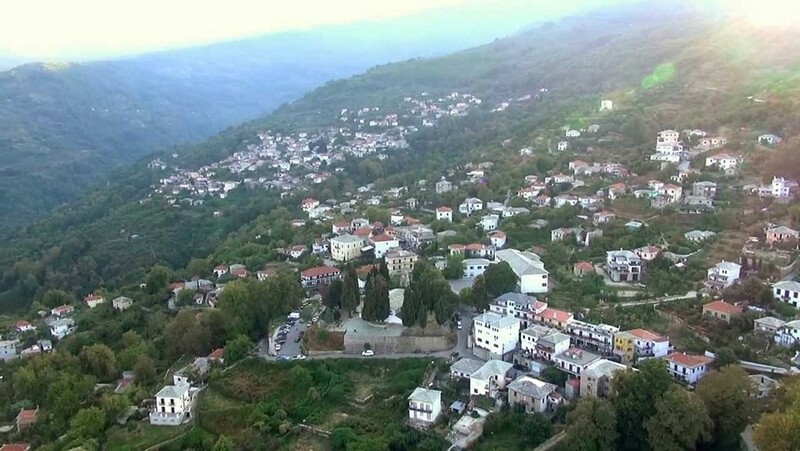 The village of Portaria in Pelion Greece is 13,5 km away from Volos. It was built in the beginning of the 13th century with core the monasteries of Prodromos and the virgin Mary of Portaria where the village got the name from. 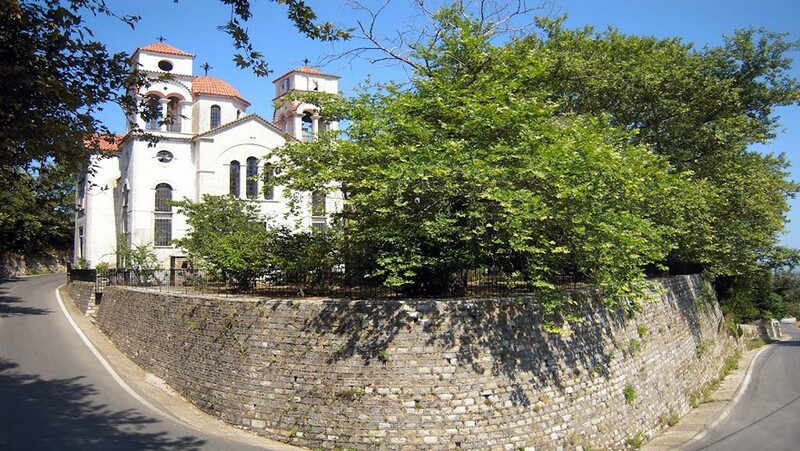 At the central square you may fin the church of Agios Nikolaos and the small church of Virgin Mary of Portaria. The monastery of Agios Ioannis Prodromos (precursor) is a bit higher up close to the fount Mana. A bit steeper one can find small water falls that offer to every visitor a unique view. Cultural events that are organized every year are reviving the local customs. After the 15th of August there is a 3 day bender with representation of marriage in the area of Pelion. 47 km away from Volos town, with a lot of mansions, paving squares and cobbled road, as well as a marvelous green landscape. 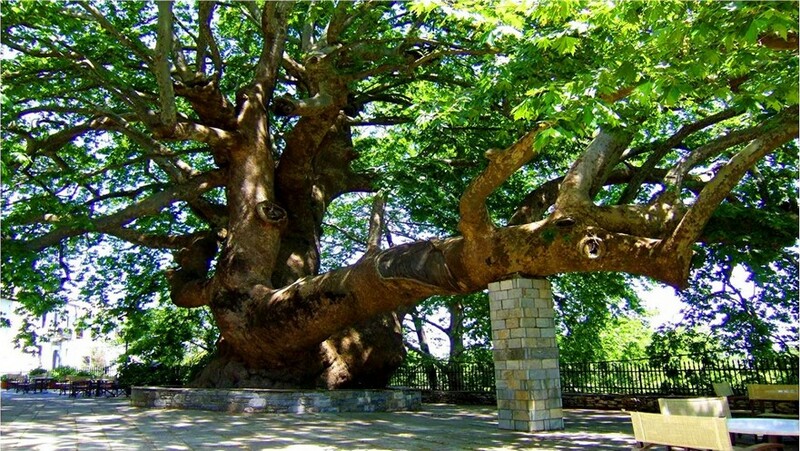 The emblem of the villageis the 1000 year sycamore tree with perimeter of 14 m. It is worth while visiting the church of Agioi Taksiarxes (Archangels Church), Agia Kyriaki and that of Agios Georgios. A little further away from the beach Milopotamos in Pelion Greece and Fakistra. The closest way to the ski center settlement Chania in Pelion Greece may not be as graphical as other villages of Pelion but it is remarkably busy, with its main street full of restaurants serving bean soup. There are many tavern and restaurants, shops with tourist activity serving the known bean soup and extraordinary special local products, such as spetzofai and local black wine – Loukoulos Tavern. From Chania in Pelion Greece, there is a road that leads to the highest point of Pelion – Pliasidi. From the village of Zagora in Pelion Greece a downhill road through fertile crop fields, gardens and a remarkable peacefulness, that the poet G.Drosinis has adored, will lead you to Chorefto in Pelion Greece, seaport of Zagora in Pelion Greece. During the summer a lot of people are gathered due to its excellent beach of length of 2 km as a combination to the crystal clear sea. From here you may go by boat in the huge caves in the area of Palaia Mitzela, where according to the mythology Goddess Thetis fell in love with Pileas.